I would just like to reassure some gardeners that Autumn splitting of plants is preferred by some people over splitting plants in the Spring. Lots of information out there I know that promotes springtime transplanting, but if you have done it recently (around the middle of October) don't worry or question it. Just wait and see what happens. And, wait until it gets good and cold though before adding that extra bit of mulch for over the winter. November is the best time. 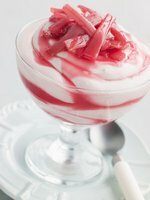 It just may turn out that for your variety of rhubarb, it would have been better to wait for Spring afterall. Like everything else, it's all trial and error. Are you doing any extra cleaning right now for the upcoming holidays? I like to "clean out" in the Spring, but I like to do it in the Fall as well. There seems to be a little voice that nags at me to "clean for Christmas" whatever that means. 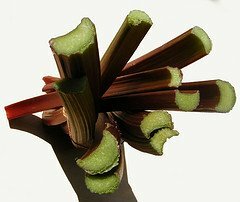 I found a good cleaning tip using rhubarb,in addition to some of the many other good uses pointed out on the site. Do you have hard-water stains in your bathroom sink, tub or toilet? High iron content in water can be the culprit. Well, apparently you can chop up a rhubarb leaf and let it soak in a plain bottle of white vinegar to make a great mineral stain removing solution. Let it sit overnight, and then try spraying the stains the next day. Let them soak for awhile, and then wipe. This is supposed to work extremely well. 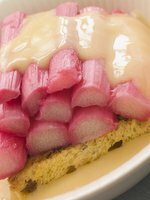 Combine the rhubarb and Splenda and place in a saucepan. Let this mixture sit overnight covered well. Add water and over medium heat, bring the mixture to a boil. Remember to stir frequently for approximately 20 minutes. 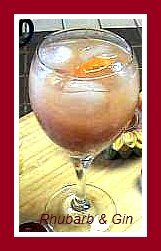 Remove from heat, and add the jello and lemon. Keep refrigerated. Bring all ingredients to a boil on medium heat in a saucepan. Stir frequently until thickened. Refrigerate. Begin by cutting your Sara Lee Cake into equal slices, depending on how many you would like to serve. Cover with foil and put into a pre-heated oven. Set the oven at 200F. If you wish, you can heat up and toast the coconut at the same time, by spreading it out on a cookie sheet. Toss the coconut occasionally. As the cake is warming through, combine all other ingredients in a saucepan, and bring to a boil over medium heat. Stir occasionally and turn the heat down. Let simmer until rhubarb is tender. Place the cake on individual plates, and spoon out rhubarb mixture over top. Sprinkle with toasted or plain coconut. Well, not everyone likes rhubarb. Actually, not everyone can "stomach" it for more reasons than one. Like many other foods, it has some negative effects as well. This lady manages to talk about it in a humorous way. Check out this post for a chuckle or two. a website of your own. Visit "here"